Orion SkyQuest XT8 Classic Dobsonian Telescope, (MSRP $349.99) Orion Telescopes. For many astronomers who are just getting started, dobsonian reflector telescopes are a popular choice. 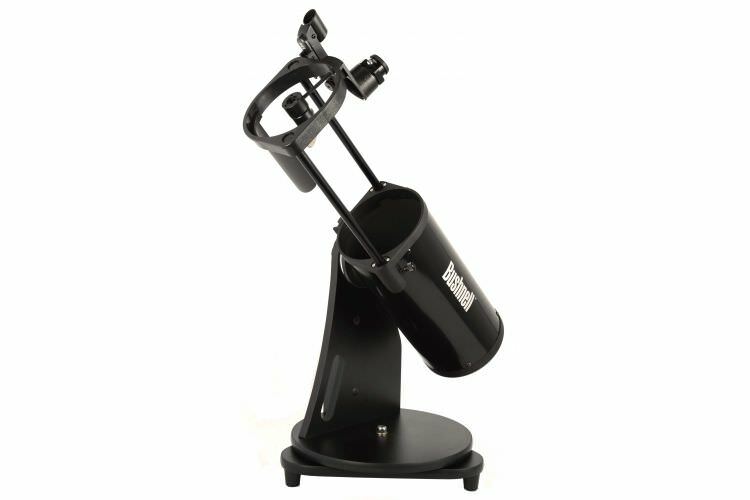 While many newcomers to Astronomy seek out computerized “go-to” telescopes, some prefer the “no-frills” setup a dobsonian telescope offers. The Orion XT8 dobsonian is a mid-range reflector telescope. There are a few smaller and less expensive models available in Orion’s classic dobsonian series, and there are a few larger, more expensive models as well. The XT8 offers a good balance between portability, price and performance. In this review we’ll look at the build quality of the XT8, along with how it performs at planetary and “dark sky” objects. For starters, let’s look at the raw specifications for the XT8. The XT8 features an 8″ (203mm) primary mirror. With a focal length of 1200mm, this gives a focal ratio of f/5.9. Advanced observers will enjoy the XT8’s 2″ focuser, which allows for larger eyepieces, or even a “T” adapter for short-exposure astrophotography. New observers (or those on a budget) will find the included 2″ to 1.25″ eyepiece adapter allows the use of 1.25″ eyepieces with no noticeable wiggle/slop. The XT8 does come with a 25mm 1.25″ Plossl eyepiece which performs well as a medium-power eyepiece in the XT8. The XT8 features Orion’s EZ Finder II sight. While the EZ Finder II isn’t a terribly bad “red-dot” finder, some observers may see fit to replace the stock finder with something like a “correct image” finder scope, a laser pointer, or even a Telrad non-magnified finder. Orion ships the XT8 in two boxes. One for the optical tube, and a second for the dobsonian mount base. The shipping box for the mount base was well thought out, minimizing potential damage to the base components. The shipping box for the optical tube was adequate, but as with any piece of delicate equipment – there can never be enough padding. Assembling the XT8 took about half an hour by myself. With a helper, the XT8 could probably be assembled in ten minutes. Once assembled the mount base is quite sturdy and allowed for smooth rotation of the optical tube, due to the Teflon azimuth bearings. Adjusting the optical tube in altitude was equally effortless and the tension springs provided enough tension to maintain position (even pointed at the horizon) without making the tube difficult to raise or lower. The mount base does include a carrying handle. At around 40lbs total weight, some users of the scope may prefer to carry the optical tube and base assemblies separately. Once assembled and put in place at an observing location, operation of the XT8 is fairly straight forward. Depending on what finder setup is used, aligning the finder may take just a few minutes, or slightly longer. Generally, using a very bright object (newcomers may want help with this step) in the finder makes the process of alignment easier and faster. When setting up the XT8 for this review, I aligned my Telrad finder and the telescope itself with Jupiter. After aligning the finder, using the XT8 is simply a matter of moving the optical tube to whatever objects are desired. Once the telescope is pointed at an object, making focus and/or eyepiece adjustments are fairly trivial. The eyepiece holder features thumbscrews which do a good job of holding eyepieces in place. The focuser offers smooth operation with very little image “wobble”. Putting the XT8 through a short observing session, I was able to obtain great views of the Moon, Jupiter, the Orion Nebula (M42), and the Andromeda Galaxy (M31). At the time of testing, the Moon was in a waning crescent phase and the XT8 brought out some great views of lunar craters near the terminator. Despite being close to the horizon, the view of lunar craters in the eyepiece were crisp and clear. Moving eastward to Jupiter revealed a delightful view of a few of Jupiter’s atmospheric bands, as well as the Galilean moons. While the view from an 8″ telescope can’t compare to the views of Jupiter from Voyager or the Hubble, the detail revealed is still quite impressive. Saving the best for last, I pointed the XT8 at M42 (Orion Nebula) and M31 (Andromeda Galaxy). Star-hopping to M31 was fairly trivial, via Alpheratz (In Pegasus). I did switch from the stock 25mm to a lower power 40mm eyepiece, as M31 does tend to benefit from lower power eyepieces, at least visually. The view of M31 provided a fuzzy patch that clearly stood out from the background stars. Moving eastward to M42, the views were breathtaking for such a relatively small telescope. Significant detail (albeit without much color) of the gas and dust was visible, along with a bright trapezium. In Summary, the Orion XT8 is a great mid-range telescope which balances price and performance quite well. Despite Orion classifying this telescope as an “Intermediate” telescope, the XT8 would be an excellent choice for a beginning astronomer, or even an experienced observer looking to add a new scope to their fleet. Assembling the XT8 was a trivial task with the included wrenches, and after assembly the telescope felt very sturdy. At around 40lbs, most people will have little to no trouble carrying the XT8 from their car to their observing spot, or from the house to a spot in their backyard. The included 25mm eyepiece works well as a mid-range eyepiece, but some users may want to invest in additional eyepieces, or at the very least a 2X barlow lens. Some users of the XT8 may choose to replace the stock finder with one of their own choosing, but the included red-dot sight is fairly adequate. With a scope as powerful as the XT8, those planning to regularly perform lunar observations may want to consider purchasing a lunar filter. Any users who choose to perform solar observations can easily obtain a glass filter lens for the XT8 at a cost of around $100. Time for me to play with some new equipment? You betcha’. And this time it’s a Bushnell proprietary design – a large, tabletop dobsonian model manufactured specifically for Optics Planet. It’s called the ARES… named for NASA’s Ares rocket… but I think it’s a regular little “lighthouse”! When I first unpacked the Bushnell ARES, I was pretty upset. It felt like it was going to fall apart in my hands and I was truly worried it had gone through some bad experiences in shipping. But the fault was not in the stars, dear Brutus… It was in my own lack of ability to see exactly how it was put together. My first impression was to tighten down the side bearing to make everything stable – totally overlooking the fact that the telescope’s balance is a long, side-mounted dovetail. Once I realized what I was doing wrong, all systems were then “Go” and it was time to do this little telescope’s magic act and utilize the incorporated truss tubes and slide it up into observing position. My, my… Look at that clean and perfect little ellipsoidal secondary! Next step… Attach included red dot finderscope. It goes on its own little metal pedestal and attaches via a dovetail. After that, a quick, cursory collimation check (and a thoughtfully provided center-marked mirror) and make sure everything is snug. When we’re set here, it’s time to take off the dust cover, which I am very happy to say has a slight offset to it which means it opens somewhat like a medicine bottle. This isn’t a dustcap that’s just going to pop off at one good bump. It is heavy duty and was very thoughtfully designed to truly protect the optics tube. Before I put in an eyepiece, however, I’d like to report that there’s nothing cheap about this little dobsonian telescope. Body parts, focuser holder, etc. are metal – not plastic. Friction bearings on the altitude and the azimuth are very positive, and once you’ve balanced the Bushnell ARES, you’ll find its weight to be very positive, secure and even major moves can be made without the assembly bumbling around. The “dobsonian” cabinet is a composite wood with overlay – and it’s actually more of an alt-az arrangement rather than the double side bearings we normally associate with a dob design. However, it is also well-crafted and sturdy. Where were we? Yes! Yes. The focuser and eyepieces. Here is one thing I will caution you on. The sliding truss tube design of the Bushnell ARES means the truss tubes are slightly lubricated. Just take care not to touch the trusses and then smear an eyepiece or get near that exposed secondary. I realize for an experienced telescope user that you’re going to know that you have something oily on your fingers if you should touch it… and that you’re not going to endanger your optics… but perhaps an inexperienced user or a child just might not have the same savvy. The little Bushnell Dob comes supplied with a 25mm and 10mm Plossl that are also of good quality which don’t want to “unscrew” themselves around the seams and have fold-up rubber eyeguards. Very satisfactory workhorse eyepieces. What do I see in deep, wide star fields? There’s a bit of coma at the edges – but I defy you to show me any reflector telescope that doesn’t display some coma. It is simply design inherent and I personally don’t think this telescope displays enough to be distracting and that is that. The next “star test” is planetary and double stars under LM5/8. Even at the modest magnification the 25mm provides, Jupiter jumps right to life – exhibiting some rusty coloration, limb darkening and the dimensional effect of the Galiean moons. While I am not a fan of high magnification, I did use the 10mm and was pleased again that when this telescope is well-balanced that you can set the friction tension to an absolute minimum and track an object smoothly without disrupting the whole set up. After having viewed Jupiter, it was time to tackle a few favorite double stars, like Kappa Piscium, Gamma Piscium, Gamma Andromeda, Eta Cassiopeia, Alberio and Polaris. They were all fine, clean splits and the Bushnell 5″ ARES dob provides very nice coloration. The last of my “tests” were a few nights that I got up close and personal with the Moon. (ok, ok… i’m guilty of looking at other things, too.) I’m equally pleased to report that during very steady pockets of seeing that the resolution was very, very nice. While the Bushnell 5″ dobsonian telescope didn’t perform like a 150mm Intes Mak on the Moon, it had absolutely nothing to be ashamed of. Crater edges were crisp and well defined. Limb edges and terminator features were sharp. All in all, it performed very well – even with high magnification! Or is that a lighthouse “keeper”? Many thanks go to Optics Planet for being so kind as to trust me with the Bushnell ARES 5″ Truss Tube Dobsonian Telescope 785000 until Ohio skies cooperated long enough to allow me to use it with the time and attention it deserves. This would make an outstanding Christmas present for an older child looking for a quality telescope and an equally fine addition as a worthy “Grab and Go” telescope for the seasoned SkyWatcher. [/caption]We get this question the time. People want to get into astronomy, and they want to get their first telescope. So, to all you experienced astronomers reading Universe Today, what do you suggest people consider for their first starting telescope? We’ve heard lots of horror stories about bad quality department store telescopes, so where should people go? How much should they expect to spend? Who are some good telescope manufacturers? What should people avoid? My first answer is always to suggest that people use a planisphere and their own eyes in the beginning, learning the constellations. Then graduating to binoculars if they’re still enjoying the hobby before even considering a telescope purchase. What’s your opinion? Feel free to respond in the comments below. What you’re looking at isn’t a vintage telescope, but a modern day long focus refractor. Custom-built to exacting standards, this new twist on an old breed doesn’t make you one of the crowd… it makes you stand out in one. Drive your car down the highway and how long does it take to spot a model that’s the same as yours? Get that new look in clothes and sure enough you’ll catch someone wearing the same shirt. When it comes to telescopes, walk through any star party and you’re sure to find a piece of equipment identical to what you own. Why not turn having a telescope into an ultra personal experience by choosing a one that’s totally unique? A Skylight Telescopes Custom Refractor can do that for you. Originally a Vancouver native, Richard takes his telescope making seriously. Every telescope he designs is individually star tested from his London home, then signed and numbered before they are released. With the exception of the focuser and optics, it’s all handcrafted and when each limited number of a model is gone? It’s gone forever. Because of their exclusive nature, Skylight Refractors were never meant to be offered “wholesale” – but now a few of them are available around the world. Where can they be found? In Europe, it’s Skylight Telescopes. In Canada, it’s Vancouver Telescope Centre or Khan Scope Centre. In the United States, it’s from my home-zone, OPT. When Skylight Refractors appeared at the 2011 NEAF gathering in Rockland, New York, it was all one could do to not want to take one home… permanently. Quite simply put, they are that beautiful and well-constructed. Lunar and planetary observing, double stars… You’re no longer just observing by rote, but practicing a time-honored craft. Just imagine yourself owning a telescope that matches the caliber of those used by the Cambridge Observatory, Coats Observatory, Carter Observatory or Yorkshire Philosophical Society. So enduring was this design that many are still in use today. Be assured that owning a classic telescope is like owning your own personal piece of history – one that will be around long after fancy has faded. I cannot thank Richard enough for allowing me to take a personal look at – and interest in – what he has to offer. Why sail along the stars when you can sail with them? Addendum: This review was intended to re-kindle the romantic and personal experience which observers feel for their equipment. Make no mistake – this is a high quality refractor which employs state-of-the-art components such as high quality Japanese glass objectives in a handmade collimateable countercell and a premium Baader Steeltrack focuser. Its design allows for high magnfication – above and beyond the call of duty, and the color correction is outstanding. This is not a “model” telescope, but a telescope modeled after a time-honored design. Its performance level – like all telescopes – relies on the eyepiece introduced. Use lesser quality and you’ll get diminuished performance. Use a premium occular and you’ll get the view you paid for! And its cost, by the way, is not only comparable to similar custom made refractors (such as Stellarvue), but even less in some instances.